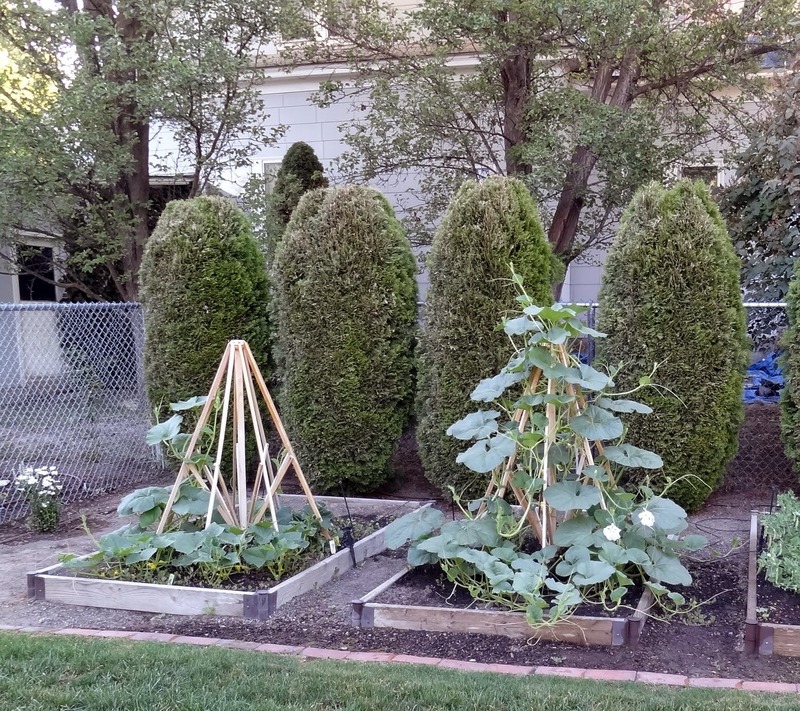 Squash House Quilts: Backyard Friend and Volunteers! Very beautiful! All we grow is a few herbs in pots on our deck. If I ever get to retire, I want a nice garden! Lovely, lovely gardens. Not envying you those temperatures. No matter the humidity level, that's hot. I'll bet you both love sitting outside and observing the goings-on in the gardens. Your artistic talents show through on the outside as much as on the inside. The heat will make everything take off (or wither) this week. LOve looking at your garden! Is your alysum a perenial? As always your garden must be the envy of the neighborhood. My favorite is the hydrangea. I'll never forget our trip to Washington and seeing those beautiful plants everywhere. I love seeing your garden posts too! You and Mr. Squash definitely have wonderful green thumbs! Single digit humidity sounds like heaven! Always a joy to see Squash Park. You two have a beautiful yard!! Hugs! Thanks, Candace. Now, I need about a quart of water to re-hydrate. Seriously, though, your garden is so lovely. You must be enjoying it immensely. Mr Squirrel is HUGE! Lucky guy....er....gal? Can you tell? Hope you are all well and happy. Yes, it's hotter than-you-know-what here, too. Thanks for the tour Candace. I have a gourd too- in the rose bed at the moment. Plants got plonked there as there was space at the time while I cleared out dead wood and pruned other things back. I think I only just got the hollyhocks out in time as they were liking it there too much. I used to have alyssum around a gravel area as it was a good weed suppressant. A useful plant. Well done for helping the bees. I have seen only a few this year which is worrying. We've got 30c due on Thursday so I'll have to water the new 39 lavenders I put in the front to help the bees. Have you thought of nastertiums? You can eat the peppery leaves as well as let them trail or climb. Happy gardening! I love when you take us on a tour of your gardens. They are simply beautiful, Candace and Mr. Squash. I have two gourd birdhouses hanging from trees in our back forty and I love them. I wonder how large yours will become? Thanks for the tour! Isn't it funny how odds and ends sometimes show up? Snapdragons are one of my favorites, so I would be happy to see them. I can't believe how DRY it is there...would you like some of our humidity? Loved the tour - thanks so much. I truly enjoy my "Squash House visits". Your gardens are so beautiful! Thanks for the tour! wish I could stroll through your garden in person. It looks like a lovely place just to enjoy. Great to see the honey bees. They are a rare sight these days. I see a few around my garden. It makes me so happy to see your beautiful, thriving gardens. Life is good at the Squash House! Paul Bunyon's Long Johns - Quilted Finish!